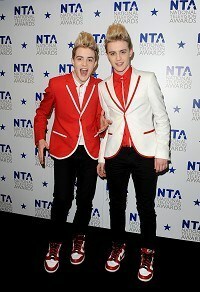 News - Jedward to enter political arena? Jedward to enter political arena? Jedward have revealed they would consider a new career - as politicians. The all-singing, all-dancing twins, who performed at a special concert for US president Barack Obama during his visit to Ireland this week, reckon they would be a sure-fire success if they turned their hand to politics in their native Ireland. "Me and John have so much power in Ireland, it's actually crazy the legion of fans we have. If we went for election we'd totally get in," Edward said. John joked: "I think Obama's going to ask us to be vice-president of America." The Lipstick singers are no strangers to the voting process, having competed in The X Factor and more recently the Eurovision Song Contest, but aren't too sure what their policies would be. Edward said: "If we were president... we're going to ask Barack Obama for advice." The pair - who are publicising the new Double Stuff Oreo Lick Race to raise funds for children's charity KidsOut - also insisted they didn't get nervous before their recent high-profile appearances. "Me and John, we just kind of zone out and realise what we've got to do," Edward said. "Everything we do we just have fun with it, there's no reason to be scared when we're on stage. People are coming to see us, they want us to do well." Despite an unharmonious start that turned the Spider-Man musical on Broadway into a late-night talk show joke, a cast album will go on sale June 14. Mel B was left a little red-faced after a hoaxer posed on Twitter as Geri Halliwell and suggested a Spice Girls reunion tour. Lady Gaga's latest album is on course to outsell the rest of the top 30 put together with around 250,000 copies sold in the first week. Gary Barlow would like an X-Men superpower - the ability to fly - while Jason Orange would prefer to be invisible, the Take That stars have revealed. A struggling singer has landed a film deal to tell of her battle to find success - before even releasing her debut album. Adele is potentially turning down millions of pounds after vowing never to play festivals or arenas, despite her astonishing success.